In Blogging, the most important thing is to keep Blogging and produce Killer Content from time to time. To do that you need to stick to the points mentioned in the 123s of Blogging. Sometimes, as a blogger you feel the need to double your blog traffic. But, it’s not that easy to just double your blog traffic at will. There are several methods with which you can attract more and more visitors to your blog. Those include – Blog Promotions, Paid Advertisements, Link Exchanges, Directory Submissions and many more. But these methods just revolve around one important thing i.e. To let people know about your blog. The problem with some of those methods is that, a newbie blogger can’t really afford it. So, one has to look around for some free or at least low cost methods. The solution is to just search inside yourself. A little effort from your end could not only double but also triple or quadruple your blog traffic. I will list out 3 Tips, which if you follow properly. 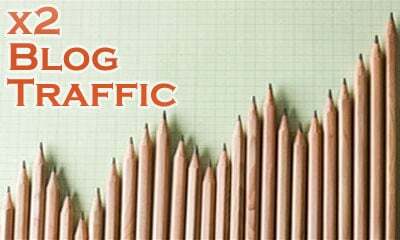 can substantially increase your blog traffic. To double your blog traffic, quality content is pretty much needed. But you must remember that, you should be consistent in writing it down and publishing it. Also, don’t mess up your publishing timings. It’s essential to maintain a good post frequency to increase your blog traffic. In case you want to change it, then make sure that you notify your readers before you implement the change. Write for the sake of helping others (Tech & other niche blogs) & expressing yourself (Personal Blogs). If you are re-writing a HowTo post which is already on the net, then ensure that you craft it in such a way that the readers and search engines would find it completely unique. Promoting your posts on Social Media sites like Facebook & Twitter is a common practice to increase your blog traffic. But to double your blog traffic, mere Social Media promotions isn’t enough. You need to promote your posts very effectively in order to get the targeted traffic on that day. Of course you must schedule a large number of posts for promotions. But, make sure that the gap between two scheduled posts is at least 3-4 hours. Else, your followers or friends will get annoyed and unfollow or unfriend you. To achieve something big, you need concentrate on small things first. So, always set small targets which you think; you can easily manage to achieve. Keep your mind set for doubling your daily traffic. Once you start doing that on a regular basis, then your monthly traffic will also double followed by the quarterly and yearly traffic. Everything depends on the way you think & look at things. Remember one thing, you won’t fetch the desired results unless you put in your 100%. NEVER loose hope if you miss out on a few unique visits on a particular day. Work harder with the intension of compensating those lost unique visits the next day. Have you ever tried to double your traffic ? If yes, which methods or checkpoints did you follow keeping the above 3 aside. Now my blog has 1,500 visits daily and I hope it can double the traffic by the end of this year. That’s my biggest goal and I am trying the solutions you mentioned above, consistent writing and focusing on social media. Nice and informative article for new blogger. Well, I do agree that if you’re writing good & unique posts regularly then you can easily attract huge traffic. At the same time you need to do some promotion as well about your post through social media. That’s a great way to attract interested readers. Nice post , Only 3 or 4 things are very valuable for a unique blog Quality of content , Writing of content , Keywords of content and many more things . It’s not an easy task but who is passionate about it definitely he will do everything for this. Everybody wants something unique but it should be logical . If blogger doing is well and aware about many things to people like any new technology or new tools or new features which such a useful too . Than definitely he will success to increase to traffic. PS – did u remove comment luv ? Great article, traffic is only way to get more money from blogging and write about how yourself do to get traffic is one of the best ways to get it. Thanks for nice post Mani! These are some good tips. I especially agree that it is important to be consistent with your writing. The worst thing that you can do when you own a blog is develop loyal readers and then ditch them because you got too busy. Always make sure that you have time to dedicate to your blog. Thanks for the article. Full of new information. I will try that way to increase my traffic. SEO is very useful in increasing blog traffic. great article , i totally agree that nothing can beat quality articles ! I have submitted my site to sites that advertise for free. I still see no traffic how do i get a lot of readers. I run a very nice looking blog with great content. Nice tips friend and it is well said that concentrate on small targets. Well, we really need the support of Search engines to make this X2 traffic possible everytime. Once you reach reputable traffic count, you need to work on SEO and keywords rich articles for constant X2 traffic. Good tips. I think the best method to get more traffic is through good SEO. Cheers! I started to get more heavily into publishing posts on my blog, commenting on other blogs, and also sharing links and information on various social media networks. A combination of the above has added about 30% more visitors in the last four months. As with everything online, it takes hard work and time to achieve great results and to see your work pay off. Social Media can gain you double traffic anytime if you promote it Strongly. BTW You should also write a Unique and Quality Content. It is very Effective for Traffic. Great tips mate! In my opinion, SEO has its merits. But a great affiliate marketing network can trump SEO from many angles. However, the core common point here is quality. Without it, nothing will get you anywhere on the rankings page! Apart from updating a Blog daily, one also needs to keep an affiliate marketing program to back-up the traffic generation process. Don’t you agree? Great post btw.. Cheers!! Social media promotion is now becoming viral. its the best source which we can use for driving some real traffic to our website. Moreover the readers that we get from such websites will be regular readers who love the unique content! Great blog. Using accounts like Facebook and Twitter is a great way to track more Blog traffic. These sites are very successful in bringing lots of traffic! I always agree with the statement that “Quality Content is the King in Blog” ! Nice post.I like the line about concentrate on small things first. You can even bring traffic in a form of link-baiting. May it be posting an info graphic or criticize someone popular or even write exciting contents!